Boston’s sultans of swag pop, the male-female duo Karmin, brought an edge to the music world through their creative YouTube covers of rap songs (and others) and eventual original music, like 2011’s “Crash Your Party” and 2012’s “Brokenhearted” and “Hello”. Each received mainstream radio airplay, with “Brokenhearted” becoming the breakout hit of the bunch, going as high as #16 on the Hot 100. Their Hello EP also charted in the top 20 on the album chart. Over the holidays, the twosome of Amy Heidemann and Nick Noonan recorded a version of “Sleigh Ride”, which was offered as a free download through a sponsorship through the store Coach, but that was the last of any new music we heard from them. Now, the duo signed to Epic Records have produced an epic single titled “Acapella”, which has now been serviced to radio. Heidemann, in her Nicki Minaj-lite style, takes to the mic and wraps her way around name-checking two childhood fairytales, a toothpaste brand, a recent Justin Timberlake single and a popular Italian restaurant chain, among other references that fall seamlessly into place. It’s a cute song and a relatable to a teen audience at the same time, especially those who feel compelled to break off their relationship. Plus, they sound like they’re having fun. It’s a little bit silly, but it’s enjoyable, especially when Heidemann goes into her “falsett-uh“. Four out of five rooster impressionists would agree she does her call well. Possibly the only aspect of the song that gets a little bit annoying is the slowed-down vocal effect throughout the song, which is trying too hard to recreate Yello‘s “Oh Yeah”. I mean, this isn’t Nick Noonan’s Day Off, hello! Or, maybe it is. This song moves pretty fast. If you don’t stop to listen to individual component, you could miss it. Let me know what you think in the comments below or on Twitter: @AdamFSoybel. 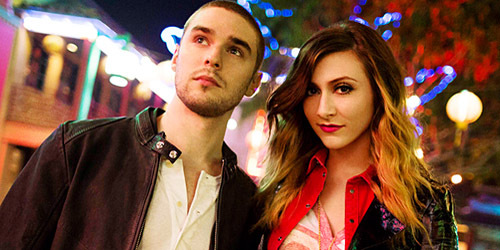 Listen to the premiere of Karmin‘s “Acapella”.